Self catering accommodation available June, July and late August, September. Bedroom 1, twin single beds, television and playstation*. Bedroom 2, twin single beds, French doors to veranda, television, wired broadband. Bathroom with Jacuzzi bath*, thermostatic shower over, toilet & hand basin. Living room has 37" TV, HD Freesat, DVD, Wii, French doors leading to sun lounge / conservatory. Outside, graveled / paved area with tables, chairs, barbecue area, lawn, sand pit and children's toys. 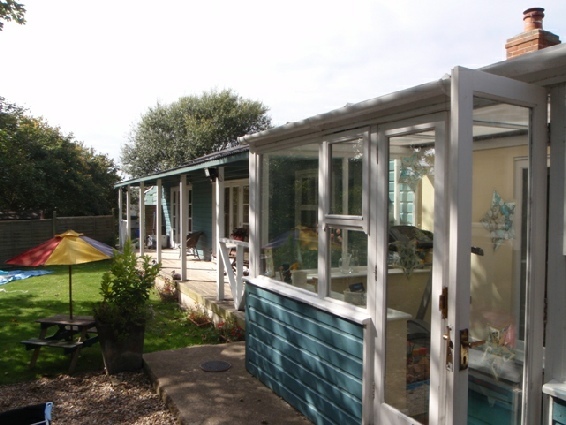 If you know Weymouth, or Weymouth people you will know that this is one of the most sought after properties in Weymouth. It’s the perfect launch site for all your sight seeing visits whether by foot or by car as a well as a home to just simply relax. The property has a friendly, family orientated atmosphere with lots of things to keep the youngsters happy as well as all the modern things that adults need when relaxing. All rooms are spacious and we’ve tried hard to improve things for those who may have their mobility impaired. Being at the heart of the Gardens the resident wildlife are regular visitors ... Bookings taken direct or via our agent - Dream Cottages.